Mb, a = actual pebble storage capacity per square meter of collector area (m3/m2). Mb, s = standard storage capacity per square meter of collector area = 0.25 m3/m2. Equation (11.18) is applied in the range of 0.5 < (Mb,a/Mb,s) < 4.0 or 0.125 < Mb a < 1.0. The storage correction factor can also be determined from Figure 11.7 directly, obtained by plotting Eq. (11.18) for this range. FIGURE 11.7 Storage size correction factor for air-based systems. where ma = actual collector flow rate per square meter of collector area (L/s-m2). ms = standard collector flow rate per square meter of collector area = 10 L/s-m2. Equation (11.19) is applied in the range of 0.5 < (ma/ms) < 2.0 or 5 < rna < 20. The air flow rate correction factor can also be determined from Figure 11.8 directly, obtained by plotting Eq. (11.19) for this range. FIGURE 11.8 Correction factor for air flow rate to account for stratification in pebble bed. If the air system of Example 11.6 uses a flow rate equal to 17 L/s-m2, estimate the solar fraction for the month of January. At the new flow rate, the performance parameters of the collector are FRUL = 3.03 W/m2-°C, Fr(to) = 0.54. Finally, from the /-chart of Figure 11.6 or Eq. (11.17), f = 0.148 or 14.8%. Compared to the previous result of 14.7%, there is no significant reduction for the increased flow rate, but there will be an increase in fan power. If, in a solar energy system, both air flow rate and storage size are different from the standard ones, two corrections must be done on dimensionless parameter X. In this case, the final X value to use is the uncorrected value multiplied by the two correction factors. If the air system of Example 11.6 uses a pebble storage tank equal to 0.35 m3/m2 and the flow rate is equal to 17 L/s-m2, estimate the solar fraction for the month of January. At the new flow rate, the performance parameters of the collector are as shown in Example 11.7. The dimensionless parameter Y is affected only by the FR. So, the value of Example 11.7 is used here (=0.20). Therefore, from the f chart of Figure 11.6 or Eq. (11.17), f = 0.153 or 15.3%. The f-chart of Figure 11.2 or Eq. (11.13) can also be used to estimate the performance of solar service water heating systems with a configuration like that shown in Figure 11.9. Although a liquid-based system is shown in Figure 11.9, air or water collectors can be used in the system with the appropriate heat exchanger to transfer heat to the pre-heat storage tank. Hot water from the pre-heat storage tank is then fed to a water heater where its temperature can be increased, if required. A tempering valve may also be used to maintain the supply temperature below a maximum temperature, but this mixing can also be done at the point of use by the user. FIGURE 11.9 Schematic diagram of the standard of water heating system configuration. Tw = minimum acceptable hot water temperature (°C). 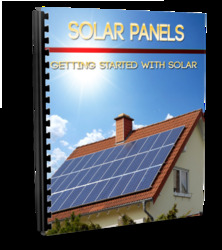 The correction factor Xc/X is based on the assumption that the solar pre-heat tank is well insulated. Tank losses from the auxiliary tank are not included in the /-chart correlations. Therefore, for systems supplying hot water only, the load should also include the losses from the auxiliary tank. Tank losses can be estimated from the heat loss coefficient and tank area (UA) based on the assumption that the entire tank is at the minimum acceptable hot water temperature, Tw. The solar water heater performance is based on storage capacity of 75 L/m2 of collector aperture area and a typical hot water load profile, with little effect by other distributions on the system performance. For different storage capacities, the correction given by Eq. (11.14) applies. 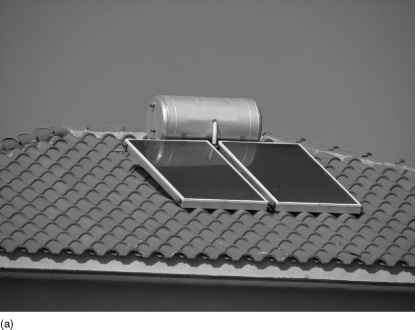 A solar water heating system is installed in an area where, for the 31-day month under investigation, the average daily total radiation on the tilted collector surface is 19.3 MJ/m2, average ambient temperature is 18.1°C, and it uses a 5 m2 aperture area collector that has FR(ja)n = 0.79 and FRUL = 6.56 W/ m2-°C, both determined from the standard collector tests. The water heating load is 200 L/d, the public mains water temperature, Tm, is 12.5°C, and the minimum acceptable hot water temperature, Tw, is 60°C. The storage capacity of the pre-heat tank is 75 L/m2 and auxiliary tank has a capacity of 150 L, a loss coefficient of 0.59 W/m2-°C, diameter 0.4 m, and height of 1.1 m; it is located indoors, where the environment temperature is 20°C. The flow rate in the collector is the same as the flow rate used in testing the collector, the FR /Fr = 0.98, and the (Ta)/(Ta)n = 0.94. Estimate the solar fraction. From Fig. 11.2 or Eq. (11.13), for Xc and Y, we get f = 0.808 or 80.8%. What is pebble bed storage?